On a recent Saturday night, we decided we wanted a nice meal out. My husband told me he was craving a steak and to take him someplace where he could get a good one. So I popped on the Internet and did my thing and came up with two suggestions in Quincy Center that I let him pick from: Alba and The Jury Room. He ended up picking Alba, because it was the first one we drove by and he found parking almost immediately right on Hancock Street. Alba does offer free valet parking in case the parking gods are not with you when you go. Alba was previously located pretty much directly across Hancock from their current location. Their new space has 2 floors with a bar and dining area on each floor. The first floor is the main dining area and bar and the decor is modern traditional with dark wood and large globe lamps. On the night we went, we were told the wait for a table on the first floor was 45 minutes to an hour but that if we didn’t mind eating upstairs we could head up there and find a spot at the bar. That is exactly what we did. The decor upstairs is not quite as snazzy as the first floor but it was still nice. We found a couple of stools at the end of the bar and ordered some drinks from the bartender to sip while we perused the menu. Alba serves up a variety of Italian and Mediterranean options including appetizers, salads, pasta, entrees, and desserts. We decided to split an appetizer and a pasta dish and ended up ordering the bruschetta and the seafood fra diablo. After his craving for steak, my husband decided he wanted pasta instead. Figures. 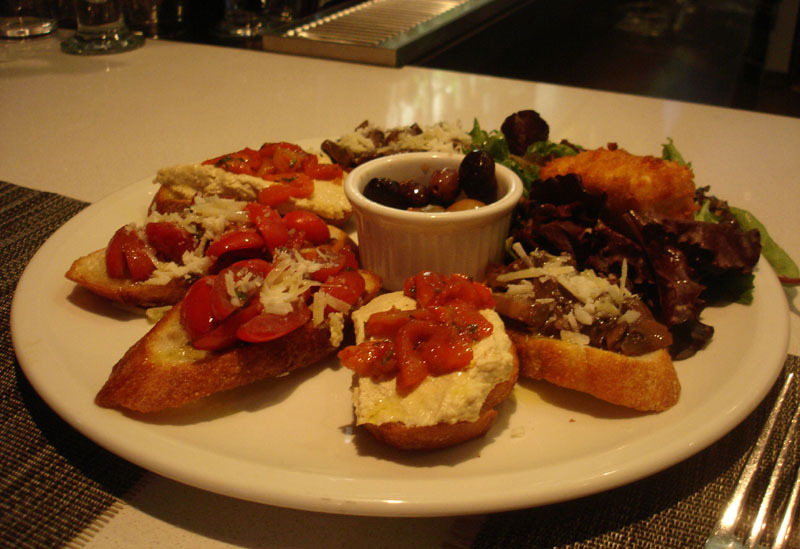 The Assorted Bruschetta ($11.50) was six pieces of toasted bread topped with 3 different toppings. There were 2 servings each of bruschetta topped with hummus and roasted red peppers, marinated tomatoes and balsamic mushrooms. They were served with a ramekin of assorted olives, and a piece of fried mozzarella on a bed of spring greens. This was the perfect appetizer to split between 2 people since there were 2 pieces of each of the 3 types of bruschetta. Both of us like the hummus with roasted peppers the best. They split the Seafood Fra Diablo ($22.50) into 2 separate servings for us in the kitchen, so we didn’t have to fight over one big bowl of pasta. 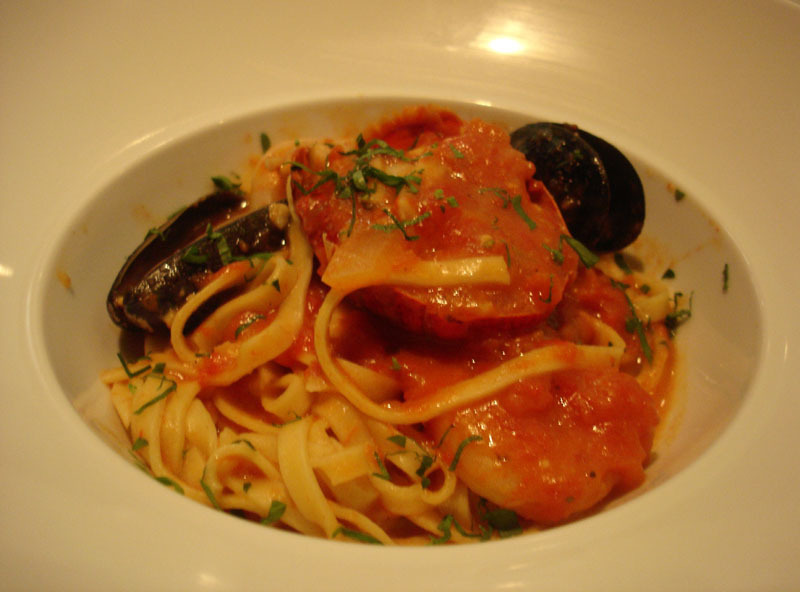 The linguine was lightly coated in a mildly spicy tomato sauce and topped with mussels, shrimp, and chunks of lobster. The seafood was perfectly cooked (no super dried out lobster and shrimp here) . It was not the best Fra Diablo sauce I’ve every had, I would’ve like it to have a bit more of a punch to it. Overall, the pasta was a satisfying meal and the half serving was enough to fill me up. I would definitely go back and try other dishes. The service was good and the downstairs dining room felt like a South End restaurant…bring a bit of a Boston vibe to Quincy Center. I give Alba 3.5 out of 5 mangoes. 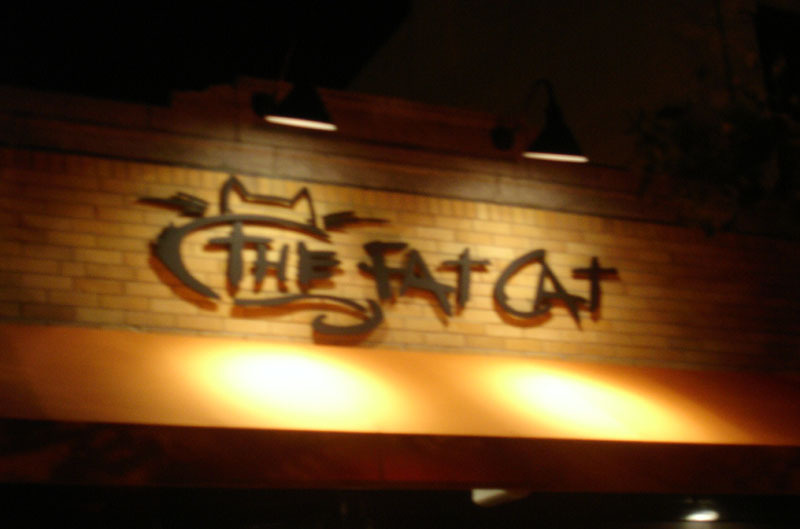 The Fat Cat is located just off of Quincy Center. Fat Cat doesn’t take reservations and they won’t seat you until your entire party has arrived. We showed up at 8 PM on a Saturday night with our party of 2 and the wait for a table was 30-45 minutes. The interior of Fat Cat is kind of small with the room divided down the middle by a half-height wall to split the room into a bar side and a dining room side. The decor is casual and industrial-chic, with visible heating ducts, wooden beams, and exposed brick walls. Fat Cat feels like it would be right at home in Cambridge or the South End. We waited in the bar area which takes up the entire length of one side of the restaurant. My husband was happy as a clam with the sitting at the bar situation since they were playing the Sox game on the flat screens hanging over the bar. The bar itself is stylin’ with an off-white mock-crocodile bar top. We ordered a couple of drinks…All of Fat Cat’s specialty cocktails have cat-themed names. I got the Pink Panther which was one of their house special cocktails. It was sweet, but strong. We ordered some calamari at the bar while we waited for our table. The calamari came in a paper cone and lightly fried and tossed with lightly fried cherry peppers and black olive slices. It was served with a slightly spicy remoulade. In the past we’ve also gotten the fried dill pickle appetizer which was very unique and tasty…dill pickle slices lightly battered and fried and served with a dipping sauce. At last our table was ready and we moved into the dining room side of the space. The dining room is separated from the bar by a half-height wall. The dining area has 2 rows of tables, one lining the half wall and the other lining an exposed brick wall. The Fat Cat menu is loaded with upscale comfort food. There are options such as burgers, sandwiches, nachos, pastas, steaks, and fish & chips. 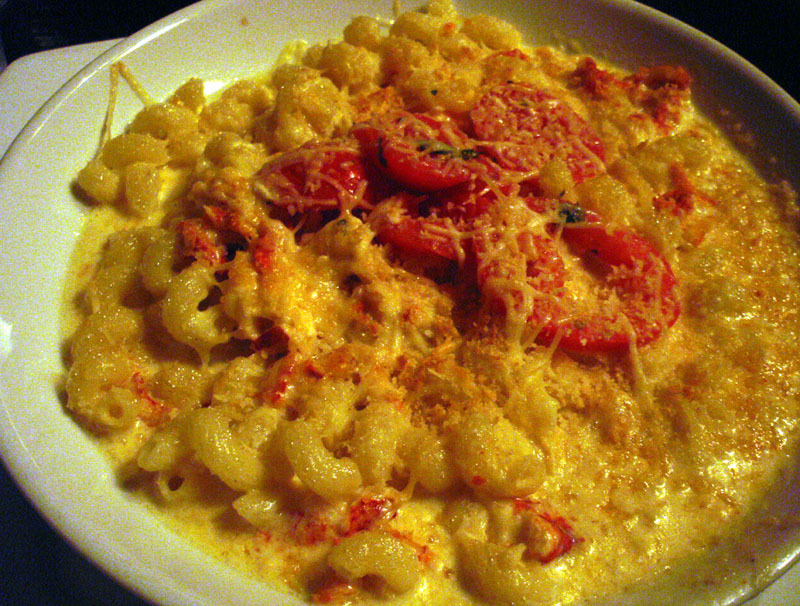 I ordered the 5 cheese Mac & cheese with lobster ($18). It was a huge serving with cavatappi pasta baked with lobster chunks and a creamy cheese sauce–all topped off with some marinated tomato slices. The dish was very rich and filling. I could barely finish half of it and I felt like I over did it at that. There was plenty left to take home for lunch the next day. 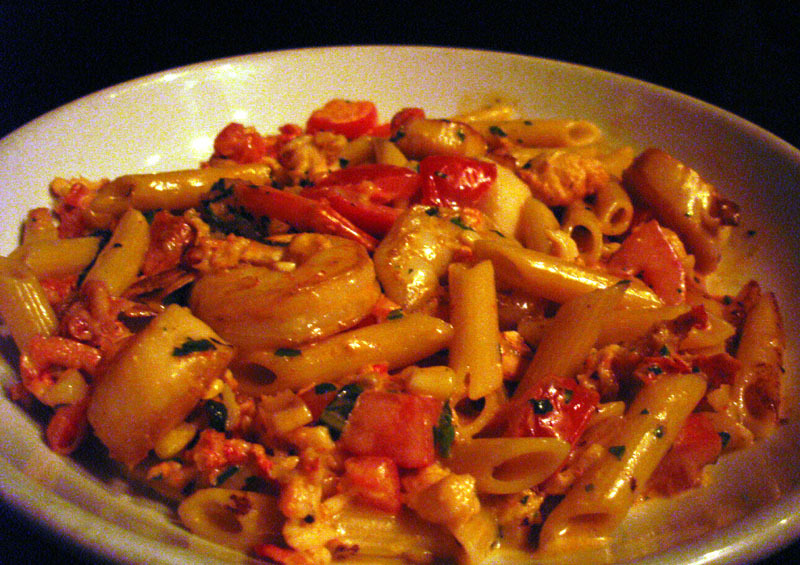 My husband ordered the Grain Special for the night, which was penne pasta in a basil cream sauce with marinated tomatoes, lobster, shrimp, and scallops. He liked it but said it needed a little more salt. His pasta was also very generously portioned and he had some to take home as well. They also had a special that night of a steak topped with foie gras and I tried to convince him to get that, but he couldn’t be swayed from the pasta. Oh well, I can’t win every time. We love us some Little Q Hotpot! Little Q is a popular chain restaurant in China and the Quincy location is its first (and currently only) American outpost. They are located in an otherwise dead Quincy Fair shopping center in Quincy Center. The shopping center is slowly dying due to the fact that the city of Quincy plans to tear it down to build a road. Hopefully, Little Q will be able to find a new home in Quincy. I would hate to lose it. We’ve been to Little Q a few times now. On this visit, it was the busiest we’d ever seen it. The area outside their entrance was crowded with folks waiting for tables. We were able to be seated immediately since we were willing to sit at an isolated counter area tucked off to the side of the restaurant. We didn’t mind, we just wanted to eat! Plus, the counter is against a window that overlooks the rest of the Asian food court area, which includes a couple of other dining options, including Taste of Taiwan. I was tempted to try Taste of Taiwan soon, based on some of the dishes that I saw people get from there. The table tops and dishes at Little Q are all made out of the same plastic, easy to wipe down material. 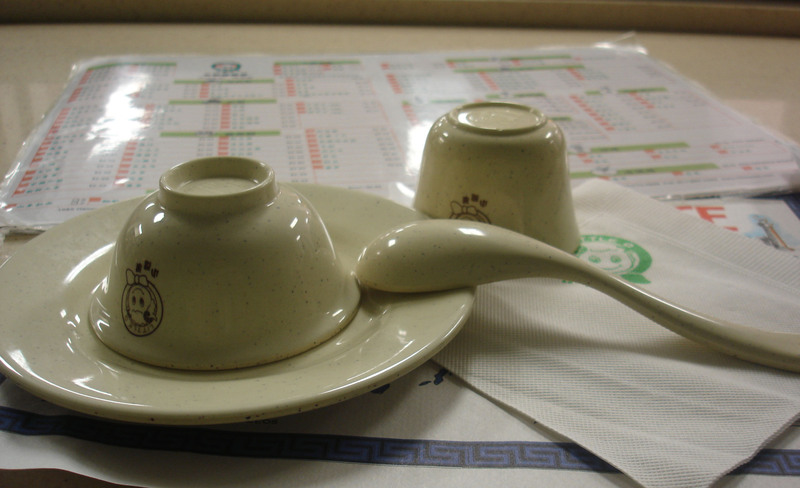 The dishes/cups and napkins are all printed with the smiling face of a cartoon goat–who I suppose is the mascot of Little Q. The decor is definitelycasual and cafeteria-esque. The staff at Little Q are all very friendly and helpful, so don’t be afraid that you’ll be lost if you have never had hot pot before. They readily help you chose from their selection of broths and then chose other items that you want to cook in the broth. These include various veggies, meats, seafood, and noodles. 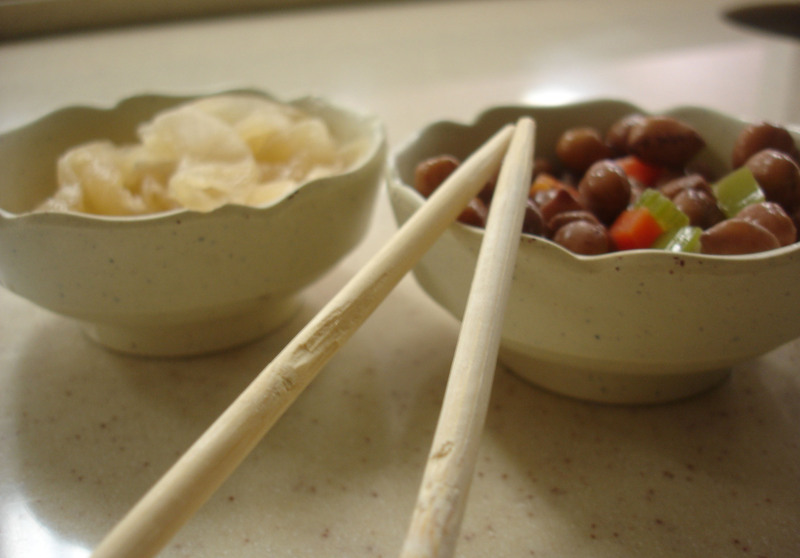 After ordering the server brings us some complimentary pickled radishes and peanuts. These are both very tasty and addictive snacks. 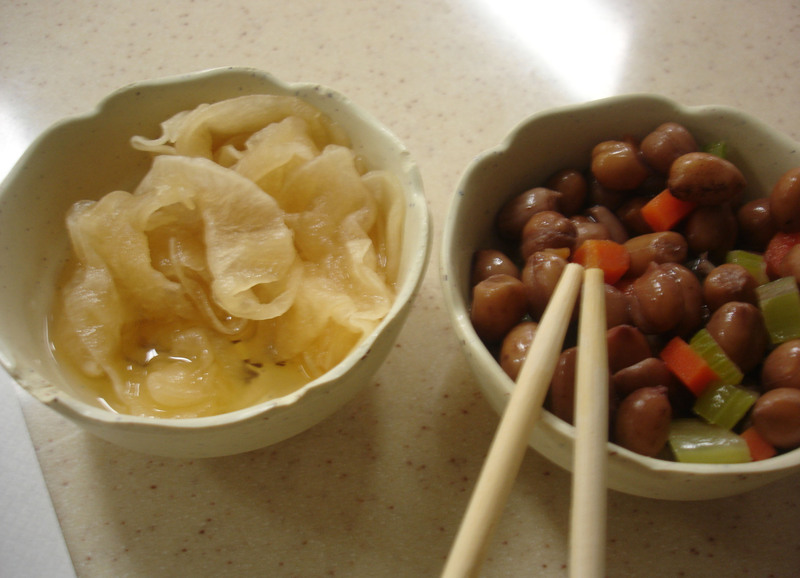 I really want to try making the pickled Daikon radish at home. Shortly there after she brings us our pots of broth, inserts them into the holes in the counter and turns on the cooktops. We ordered the seafood broth. It comes out with green onions, ginger and various spices floating in it. 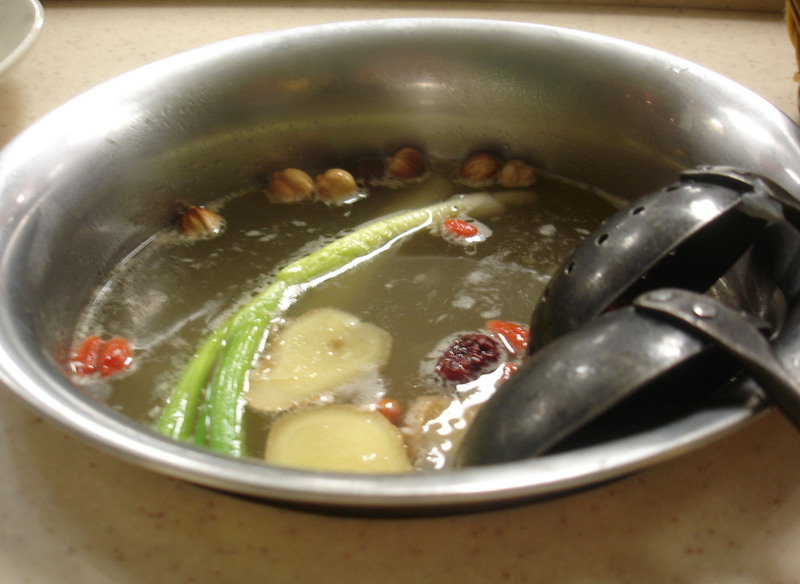 The broth is very fragrant and flavorful and the flavor gets enhanced with each new piece of meat or veggie that you put in. I love the way the fried tofu and bok choy pick up the flavors of the broth. This visit we ordered several items to go in our soup: Baby Bok Choy, fried tofu, white mushrooms, chicken breast, white fish and shrimp. 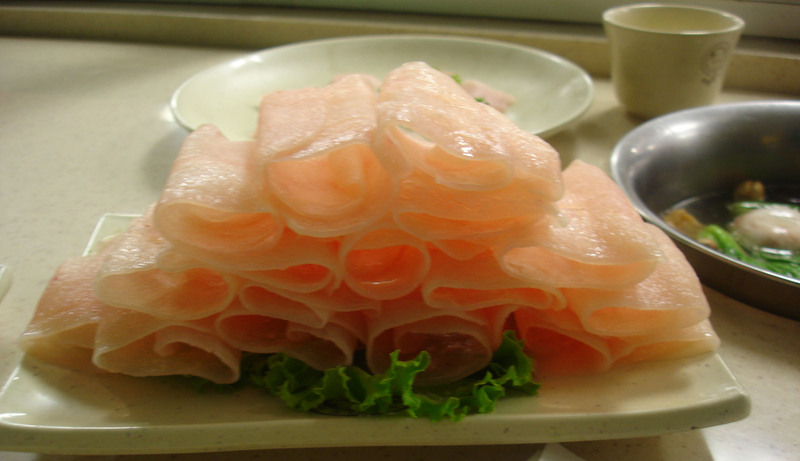 The chicken breast comes out thinly sliced and arranged in rolls. All of their items are always super fresh. Then we just put our ingredients in the broth and let them cook. Part of the trick of eating at a Mongolian hot pot place is the timing for how long the items need to cook in the broth. The different items take varying amounts of time. The thinly sliced chicken cooks up in just seconds. Little Q often has this information printed on the place mats at each table setting. Although for some reason, this past weekend, the placemats had Greek tourist spots printed on it. Hmm! 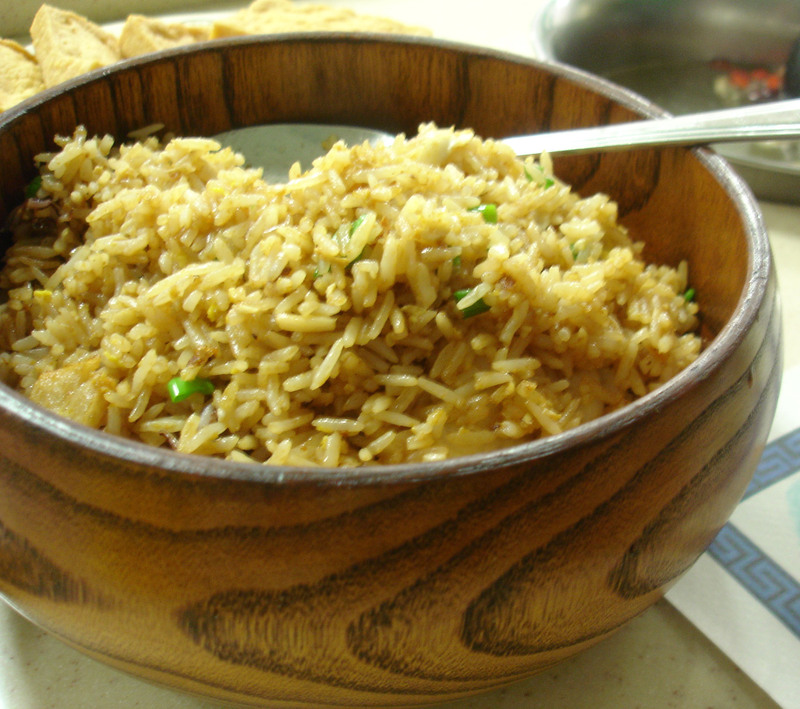 Their seafood fried rice is also very good. It contains scallops, white fish, shrimps, and squid. Little Q’s scallion pancakes are also phenomenal, but we didn’t order them this past time since we didn’t want to get too much food. We got mango (can’t resist it) ice cream for dessert, which is a great refreshing way to end the meal. I give Little Q Hotpot 4.5 out of 5 mangoes.